New world records were set for 1930s sports racing Lagonda and OM cars at the 2014 Bonhams Goodwood Revival classic car auction. Two further cars sold for over a million dollars each: the almost obligatory Mercedes Benz 300 SL and a Ferrari F40. For once, a Ferrari was not topping the results despite 17 Ferraris on offer. The annual Bonhams Goodwood Revival classic car sale was held on September 13, 2014. On offer were 106 cars and 172 automobilia lots grossing just over £15 million for the most successful Goodwood Revival sale ever. The Goodwood Revival sale usually attract a significant number of racing cars and 2014 was not exception – racing cars from the 1930s achieved the best results with two racing Maseratis just missing out on the million dollar mark. *Prices include buyer’s premium. Sale was held in British Pound, $ conversion as given by Bonhams the day following the sale. The highlight of the Bonhams Goodwood Revival 2014 sale was as expected the 1936 Lagonda LG45R Rapide Sports Racing Two-Seater that achieved £1,569,500 ($2,547,728) – a new record high for the marque. The 1936 Lagonda LG45R Rapide Sports Racing Two-Seater with coachwork by Fox & Nicholl is arguably the most famous Lagonda and with registration number EPE 97 one of the best-known British racing cars from the pre-war period. A new marque record was also set for the 1930 OM 665 SS MM Superba that sold for £1,255,900 ($2,038,669) at the Goodwood Revival 2014. 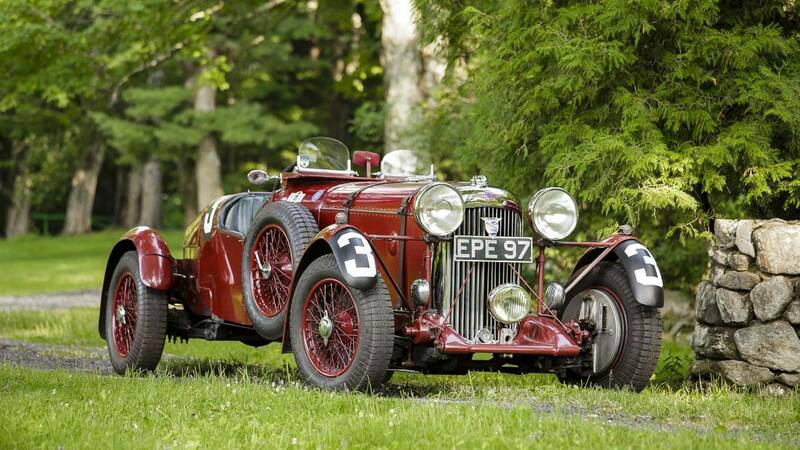 The MM indicates its Mille Miglia participation history – it won its class and finished fifth overall in the 1930 race. OM (or less romantically Officine Meccaniche) was based in Brescia like the start and finish of the Mille Miglia and thus this car is a particularly welcome entrant at Mille Miglia retrospective races. Presently, no classic car auction seems complete without offering a 1950s Mercedes Benz 300 SL. However, the car’s omnipresence also reveals that they were produced in relatively high numbers and that many have survived to the present. The 300 SL remains popular although in recent auctions some have failed to clear unrealistically high estimates. The 1957 Mercedes-Benz 300 SL Roadster on offer at the Bonhams Revival 2014 came without any particularly noteworthy history. However, it achieved £651,100 ($1,056,913) – £100,000 over Bonhams conservative highest estimate. A 1991 Ferrari F40 achieved £634,300 ($1,029,642) at the Bonhams Goodwood Revival 2014 sale. It was one of 10 Ferraris from the Maranello Rosso collection on offer at the Goodwood Revival 2014 sale. Bonhams famously sold 10 Ferraris from this collection at Quail Lodge 2014, including the 1962 Ferrari GTO that achieved a world record $38 million. At least six Ferrari F40s achieved over a million dollar at public auctions thus far in 2014. Bonhams alone sold four of them. Bonhams will offer the ex-Nigel Mansell Ferrari F40 as the highlight of it’s Bonhams Zoute Grand Prix Sale in Belgium in October 2014 – the current guide price of £480,000 to £640,000 seems conservative. The Goodwood Revival Sale was the last of Bonhams major annual classic car sales where multiple results of over or near a million dollar can be expected. However, a few high prices and many very interesting cars will still be on offer at Bonhams sales including Preserving the Automobile and London to Brighton Run Sales in October and the Bond Street Sale late in November.